When I began work on the Patriot Guard Riders website, I was looking for photographs that represented who we are and what we do. At the time, one of the criteria was that we not have recognizable faces. 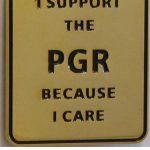 We have an oft-repeated motto within the PGR – “It’s not about us”, and I wanted to represent what we do as a group, rather than individuals. Then I ran across the photo of Dave Keough that made me reconsider. The photo was of an 11 year old standing in the rain, with a look of steely determination. Dave was standing a flag line at the dignified transfer for SSG David Wyatt at the Nashville, TN airport. This is the story behind his photo that went viral, and quite simply, it’s the story of what we do.